The Japanese laurel, also known as the spotted laurel, is a handsome plant with thick, dark green leaves scattered with yellow stains – hence the word “spotted” in its name – and very prominent red berries that are inedible to humans, but also unattractive to birds. 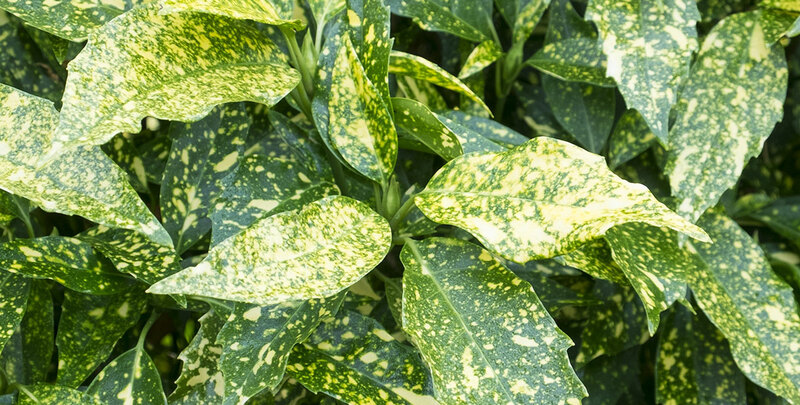 The name of this species may be a little misleading, as the spotted laurel is not actually part of the laurel family, but rather part of the aucuba genus, which explains its botanical name aucuba japonica. This name also reveals that the spotted laurel is an evergreen, as the Japanese words “aoki ba” literally mean “green leaf”. It will hold on to these glossy, green leaves all year round. Despite the fact that the spotted laurel is not particularly common as a hedging plant, it lends itself perfectly for this purpose. In fact, this species is an evergreen hedging plant that has a little more to offer than most other evergreen species that are suitable for hedging. The spotted laurel will give your garden a lively appearance due to its attractive, large leaves and its countless red berries – without being too unconventional, demanding or expensive. It is a very vigorous plant that will last for decades without requiring too much maintenance, which makes the spotted laurel an excellent hedging variety for every garden enthusiast, regardless of your level of gardening experience. 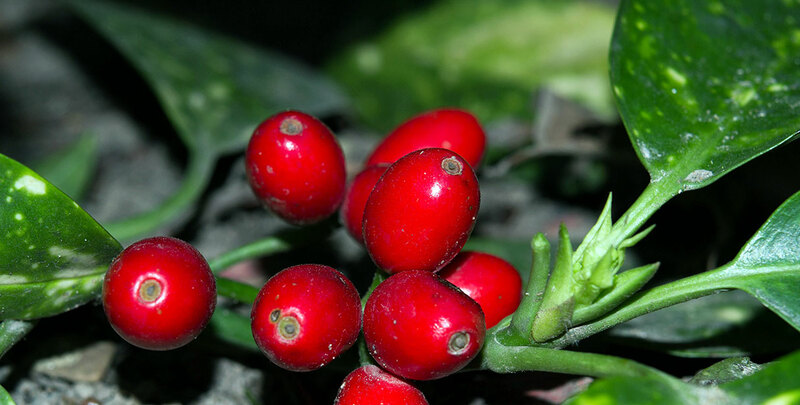 Beginners and experienced gardeners will be able to enjoy this attractive hedging plant equally. As one of its common names already reveals, the Japanese laurel is native to East Asia. It originates from the moist areas of Korea, China and of course Japan. It was introduced to the UK in the late eighteenth century and it was immediately appreciated for its striking, glossy leaves. During the early nineteenth century, the spotted laurel became widely cultivated for ornamental use, which is when it gained one of its nicknames: the gold plant, referring to the bright, yellow spots on its leaves. All plants that were grown at the time were female, however, so when renowned Scottish botanist Robert Fortune travelled to Japan in 1861, one of the purposes of this journey was to find a male specimen to fertilise the female plants with. Due to the introduction of male plants, the spotted laurel was able to produce its lovely red berries. And went on to become one of the most popular ornamental plants throughout Europe and the UK. There had been a slight dip in its popularity after World War II, likely as a reaction to the fact that it was seen almost everywhere, but it did not take long until various cultivars were developed, most of which are still widely available at garden centres to this day. This is hardly surprising, as their glossy, vibrant leaves are sure to make any garden look a little livelier and more importantly, the spotted laurel is able to thrive under many difficult circumstances. It can even handle coastal winds and pollution. The spotted laurel is not only beautiful, it is also a tough hedging plant. The spotted laurel is a hardy, attractive hedging plant that will grow in a variety of soils and is not too demanding regarding its planting site. It will thrive in the sun, in semi-shade or even in the shade and its location does not affect the variegation of its leaves, which is somewhat unusual for a species that carries variegated leaves. The species has an average growth rate of about 20 to 30 centimetres per year, which is not the quickest growth rate found among hedge plants, but certainly not the slowest either. Ultimately, a spotted laurel hedge will reach about 2.40 metres in height and is therefore a great way to protect your privacy with a hedge that is somewhat less formal in appearance than most other evergreens. As stated before, maintaining a spotted laurel hedge is relatively easy. Pruning once a year will suffice. It does not matter much when you choose to prune your spotted laurel hedge, though we would strongly advise against trimming it during periods of frost. We also strongly recommend you use secateurs for pruning your spotted laurel hedge, as you will risk damaging its beautiful leaves should you use hedge shears. 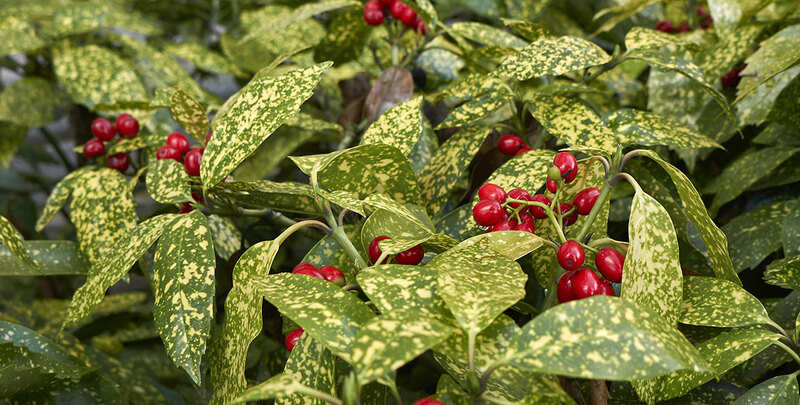 We have described two varieties on our website, of which the female ‘Variegata’ is the most popular due to its bright, red berries. If you are looking for a spotted laurel hedge solely because you like the elegant look of its leaves, you could also opt for the male ‘Crotonifolia’ variety. Both varieties are equally undemanding. There are not many evergreen hedging plants that will thrive in gardens located near the coast, but the spotted laurel offers the opportunity to grow a hedge that does not only provide you with privacy, but also with a beautiful appearance. 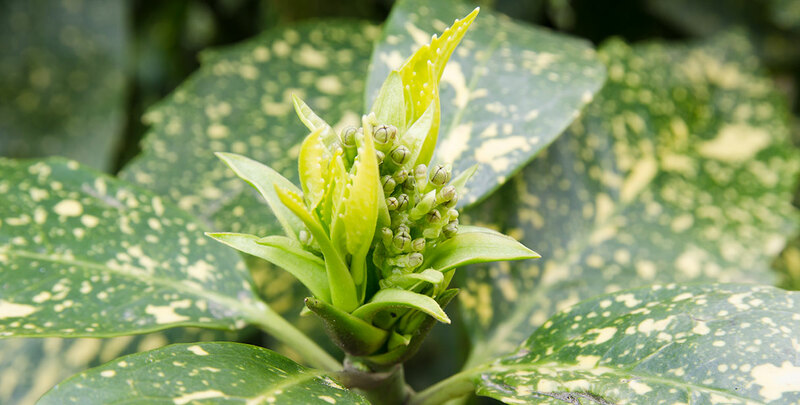 Its glossy, spotted leaves will make any garden look a little better even during the coldest months of the year and its undemanding nature, as well as its ability to handle even pollution makes the spotted laurel a hedging plant that you will not have to worry about. It can even be grown indoors, as it makes a beautiful potted plant, but it is most often seen as a tall, somewhat informal hedge. Whether you are a gardener who is just starting out and are simply looking for a beautiful hedging plant that is easy to maintain or you are an expert who knows exactly how to get the best out of any hedging plant, the spotted laurel will certainly make your garden look a little better.